The Purepecha (also known as Tarascan) are an indigenous group who have migrated from the northwestern region of the Mexican state of Michoacán. Their primary languages are Spanish and Western Highland Purepecha. Children in the public school system in the USA are frequently bi or tri lingual. The Purepecha established the Tarascan state in the 14th century, which was one of the major pre-Columbian civilizations of Mesoamerica. The Purepecha were one of the last peoples in Mexico to fall to Spanish rule and religion, and to this day, they continue to maintain their pre-Spanish conquest language, as well as much of their distinctive cultural and religious forms. The primary religion practiced by the Purepecha is a mixture of Cultural Catholicism layered over their traditional pre-Conquest polytheistic animistic religion, and is rooted in the reverence of santos, their ancestors, and spirits in nature. 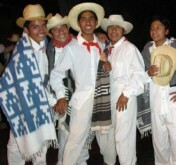 Their religion is expressed through traditional fiestas, rites, and customs. Pray for the few Purepecha believers to boldly proclaim the gospel to their people. Pray that the barriers of traditional Purepecha religion would be broken down. Pray for more workers for the harvest, both for the Purepecha in the United States, as well as those in Mexico.